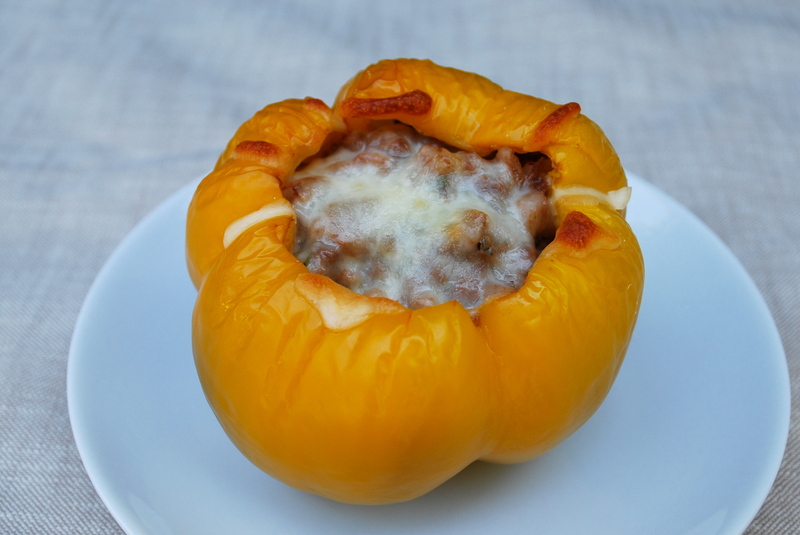 Meat Stuffed Peppers | Time to Cook! My mother-in-law “Cille” made this for our family when she was visiting and we loved it. It’s healthy and tasty, it’s a meal in and of itself, it doesn’t make a huge mess in your kitchen, it can be made ahead (I love this! ), and you can easily freeze extras for a future dinner. She used to make this all the time for her four hungry boys growing up (they loved this in high school). I thought I would take a crack at updating this classic. For the bell peppers, I substitute yellow and orange peppers for the traditional green peppers (I still make a green one for my husband who is nostalgic!) Instead of hamburger meat, I use ground bison (it’s healthier and I think tastes so much better). Instead of white rice, I use farro (it has a nice chewy texture and is fiber rich and is full of minerals) and you can also use pearl barley (also a great source of fiber and can lower cholesterol) or just brown rice. Adapted from my mother-in-law Cille’s recipe and one from Emeril Lagasse. In a large pot of boiling water, parboil the peppers until just tender, 2 to 3 minutes. Remove with a slotted spoon and dry on paper towels. In a large saute pan or skillet, heat the oil over medium-high heat. Add the onions and cook, stirring, until soft, about 3 minutes. Add the bison meat, garlic, parsley, salt, black pepper, and pepper flakes. Cook until the meat is browned, stirring with a heavy wooden spoon to break up the lumps, about 5 minutes. Pour off any excess fat. Add the farro or barley and tomato sauce and stir well. Remove from the heat and adjust the seasoning, to taste. Pour enough water into a baking dish to just cover the bottom, about 1/8-inch deep. Stuff the bell peppers with the rice mixture and place in the baking dish. Top each pepper with plenty of shredded cheese. Bake until the peppers are very tender and the filling is heated through, 30-35 minutes. Delicious!! And so easy to make.